Gill’s Grilling isn’t exactly what it sounds like. “We don’t grill anything,” says founder Brian Gill. “I just liked the way it sounded.” But what the eight-year-old company does do is provide daily meal service and kitchen management for 21 fraternity and sorority houses at the University of Maryland. 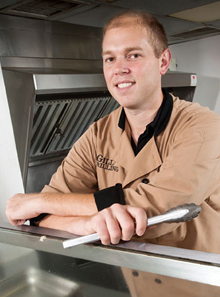 Gill launched Gill Grilling Company the summer before his senior year at the university. When his fraternity moved into a chapter house on Frat Row, Gill was tasked with filling the house with tenants so that the fraternity could pay its rent. When one prospective tenant expressed reservations about living so far from the dining hall, Gill promised that he would personally cook for him. “In the name of filling a room in a frat house, Gill Grilling Company was founded with a grand total of one customer,” Gill says. He also had a centralized kitchen, which meant having to deliver meals all over campus. Gill initially lacked a vision for his fledgling business. “As a company, we failed to analyze how our situation at any point in time fits in with the long-term plans of the company,” he says. The realization that he needed a long-term plan led to a total revamp of the company and a focus on customization over automation. Gill abandoned the office and began working from home. He started using chapter house kitchens, which eliminated an extra manager and the delivery driver. He hired and trained chefs to work full time at the fraternity and sorority houses, seven days a week. Gill had his suppliers deliver to the job sites. To share your story, e-mail Greg Galdabini at ggaldabi@uschamber.com.